Precious metals ended divided Friday. 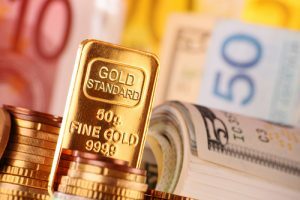 Gold and silver were among the gainers with the former ending at an almost 10-month high and the latter closing at a more than 1-week high. Gold for December delivery advanced $5.90, or 0.5%, to settle at $1,297.90 an ounce on the Comex division of the New York Mercantile Exchange. The settlement is the highest since Nov. 4 when gold prices ended at $1,304.50 an ounce. For now, "the rebound in gold prices likely reflect speculators testing the highest price levels for this year and focusing on continued policy uncertainty and risks of a debt ceiling showdown for the U.S. government," MarketWatch quoted Rob Haworth, senior investment strategist of U.S. Bank Wealth Management. "In our view these issues are likely more transitory, and the strength in gold is likely to abate with a debt ceiling resolution and continued Fed policy normalization." "Fifteen market professionals took part in a Kitco News Wall Street survey. Eleven voters, or 73%, see gold prices rising by the end of next week. There were two votes, or 13%, for both lower and sideways prices. The Kitco online Main Street poll resulted in 788 votes, with 375 participants, or 48%, calling for gold to climb over the next week. Another 340 voters, or 43%, said that gold will fall, while 71, or 9%, were neutral." Elsewhere, silver for September delivery added 8.6 cents, or 0.5%, to settle at $17.049 an ounce. The close is the strongest since a week ago Thursday, Aug. 17. Silver futures inched up 0.3% this week after sliding 0.4% last week. They are 6.6% higher so far this year. October platinum declined $3.50, or 0.4%, to $979.10 an ounce, for a 0.3% weekly loss. Palladium for September delivery dropped $5.10, or 0.5%, to $931.05 an ounce, but edged up 0.4% for the week. On Monday, the precious metal ended at $939 an ounce for its highest settlement since February 2001. Both metals are higher on the year to date with gains of 8.1% for platinum and 36.3% for palladium. Gold declined $3.70 or 0.3%, to 1,285.30 an ounce. Silver added 9 cents, or 0.5%, to $17.02 an ounce. Platinum fell $2, or 0.2%, to $975 an ounce. Palladium declined $10, or 1.1%, to $930 an ounce. For the week, losses totaled 0.8% for both gold and silver, 1% for platinum, and 0.2% for palladium. Gold coins advanced by 4,500 ounces with splits of 4,000 ounces in American Gold Eagles and 500 ounces in American Gold Buffalos. Gold coins sales were flat last week. Silver coins advanced by 190,000 ounces this week compared to 125,000 ounces last week. American Silver Eagles accounted for all silver sales for an eighth straight week. That will change next week with the five-ounce piece commemorating Ellis Island launching on Monday, Aug. 28. Below is a sales breakdown of U.S. bullion products with columns listing the number of coins sold during varying periods. Products with an asterisk (*) are no longer available.